Headaches can be helped with upper cervical care. Preventable health conditions makes up approximately 80% of the burden of all health conditions and 90% of all health care costs. Headaches are frequently caused by compression of cervical nerve roots and prolonged tension of the neck muscles. Employers are beginning to realize they can take advantage of this statistic and work to provide services to decrease the occurrence of those preventable diseases. On-the-job pain (including back pain, headaches and arthritis) costs employers nearly $47 billion a year in productivity loss. Headache produced, on average, 3.5 hours of lost productive time per week. Headaches are more frequently caused by spinal stress than any other condition. In the past few decades, there have been an increasing number of patients throughout the country that have begun to seek alternative forms of therapy for all types of conditions, including headaches. One form of treatment that is very promising for physical as well as other types of pain is Upper Cervical Chiropractic. Upper Cervical Chiropractic is a health care system that is founded on the premise that a proper functioning nervous system is essential to overall health and function of the human body. Upper Cervical Doctors detect and correct vertebral subluxations by physically correcting the upper cervical spine. This restores the nervous system to an optimum level of function, which maximizes the body’s inherent healing potential. Acute flexion-extension injuries, typically seen in auto accidents, can cause whiplash trauma to the cervical spine, even in the absence of bony damage and immediate pain. These injuries are extremely common and often lead to conditions such as chronic headaches and Fibromyalgia. When a person goes to school to learn about chiropractic, they begin by studying the human anatomy in great detail, just like other medical professionals. However, in addition to looking at how all of the parts work together physically, their training primarily revolves around the treatment of misalignments in the spine known as subluxations. 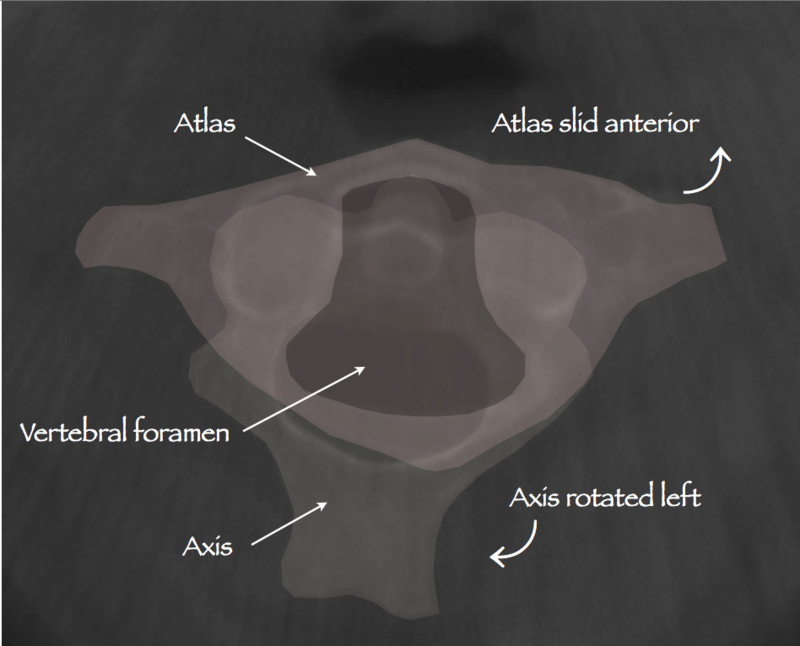 Image of an upper cervical misalignment that may lead to a subluxation. On the first visit with Healthful Chiropractic McKinney’s Upper Cervical center, a review of previous health issues will be completed, including advanced imaging to determine what types of nerve blockage may be occurring. They will listen to the patient attentively and make an assessment, including determining what types of treatment will best suit the patient. Headaches are frequently caused by compression of cervical nerve roots and prolonged tension of the neck muscles. The upper cervical doctor will assess the area and then move forward with treatment known as a upper cervical specific correction in order to relieve the pressure and pain. The relief is usually instantaneous, with an increase in positive symptoms for the following few hours. However, upper cervical chiropractors don’t just focus on relieving symptoms but rather correcting the problem; therefore, additional treatments will follow to help correct the cause. In addition, the doctor will take the time to educate you on the importance of chiropractic, especially if you’ve never been to one before. If you need further help with your headaches or are ready to see how beneficial upper cervical care can be to your overall health, please give us a call so that you can schedule an appointment with our Upper Cervical Doctor.